The exiled wife of China’s prominent jailed dissident lawyer Gao Zhisheng on Tuesday expressed doubt over whether her husband is alive, saying she can not trust the authorities who say he is serving his latest imprisonment in a remote region. Speaking to RFA as visiting Chinese Vice President Xi Jinping met with U.S. President Barack Obama at the White House, Geng He, who fled to the U.S. with her two children in 2009, said she worries about her husband’s safety as he had disappeared for lengthy periods and re-emerged to say he had been tortured. “This government lied about his situation all along. Can we believe what they say? Can we believe Gao Zhisheng is still alive? That is our worry,” she said in an interview. Authorities in Beijing have said little publicly about Gao, one of China’s most outspoken dissidents, although his case has been highlighted by foreign governments and human rights groups across the globe. But, in December, China’s official Xinhua news agency said in a terse announcement that Gao had been imprisoned for three years for repeatedly violating his terms for probation for "inciting subversion" of the state. Geng, who has not spoken to Gao for nearly two years, said she had become more concerned over Gao’s life after his brother traveled to a jail in Shaya county in the far northwestern Xinjiang region where in December they were informed Gao was being held. Prison authorities told the brother that Gao was not allowed visitors and did not want to see his family, Geng said. “He used his career as a lawyer to work for fairness and human rights principles. 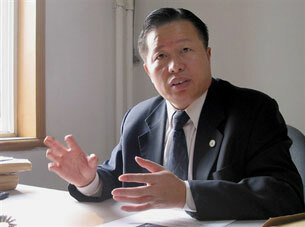 But the situation is that the Chinese government harshly persecutes the good lawyers that the people need,” Gao said. “We have no idea if he is indeed alive,” Jared Genser, Gao’s lawyer in the U.S., said in an interview. Genser said that Gao’s case stands out for the brazenness with which the Chinese authorities have withheld information about his situation, despite international attention. “While I would like to believe the Chinese government, they have repeatedly lied about this case,” he said. “I could see why, if they had killed him – from torture, for example –they would want to postpone making that public until after the leadership transition … and why they would want to keep that very much under wraps at this sensitive time,” he said. Vice President Xi is widely expected to take over the leadership of the ruling Chinese Communist Party later this year and the government in 2013. “They are flagrantly lying to the international community and torturing not only Gao Zhisheng, but also his family is being tortured by the lies they are telling to the international community and to the family themselves. I think that is the most disturbing part about this case,” Genser said. “Whatever he does, I support him,” Geng told RFA, speaking about how hard Gao’s ordeal has been on her children. “It has been four years since I spent Valentine’s Day with him,” she said, and brought out a Valentine card that her son, Peter, made for his father. “I’ve wanted to grow up to be like you. I hope you can come home soon. I love you,” he had written. Reported by Zhang Min and Wei Ling for RFA’s Mandarin and Cantonese services. Written in English with additional reporting by Rachel Vandenbrink.